$40.00 Badge for Combat Minesweeping, early version, circa late 1960s - early 70s issue. Excellent condition. $15.00 Badge for Combat Minesweeping, a relatively early, circa mid 1970s - early 80s version. In excellent condition. $5.00 Badge for Combat Minesweeping, 1980s. $375.00 For Voyage to England, 1956. 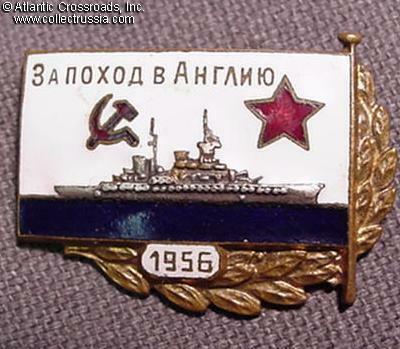 Scarce badge for participants representing the USSR in '56 naval procession at Spithead. $170.00 Badge for Long Distance Voyage,	to a participant of the Yug ("South") Naval Exercises, 1971. Excellent condition. $290.00 Submarine Commander Badge, circa 1950s. Scarce, relatively early version in gold with much nicer details and enamel than the later issues. In excellent condition. $20.00 Surface Ship Commander Badge, circa late 1980s - early 90s. Near mint condition. $40.00 Zhdanov Military Political Academy (VMPU) 30th Anniversary badge, circa 1960s-70s. Excellent condition. $30.00 Pacific Ocean Highest Naval Academy (TOVMMU), 30th Anniversary badge, circa 1960s. Brass, enamels. $25.00 Badge Commemorating the 50th Anniversary of the Popov Naval School of Radio Electronics,	1983. In gilded brass and high quality enamels, extremely well made. Shows Leningrad mint mark. $20.00 WW2 Naval Infantry Veteran badge, circa 1970s-80s. Shows Naval Infantrymen hitting the beach. $35.00 Naval Infantry Veteran badge, 1970s-80s. Excellent condition. $20.00 Veteran of Twice Order of Red Banner Baltic Fleet, late 1960s - early 1970s. In excellent condition. $30.00 Dnepr Military Flotilla 60th Anniversary, Veteran's Badge, 1979 issue. Excellent condition. $35.00 Badge of a Veteran of the Order of the Red Banner Danube Flotilla, 1970s-80s. $15.00 Veteran of the Order of the Red Banner Black Sea Fleet, circa 1970s. $30.00 Document for the Black Sea Fleet Veteran badge, 1982 issue. $40.00 Badge of a Veteran of the Order of the Red Banner Caspian Flotilla, circa 1950s-60s. $45.00 Badge Commemorating the 50th Anniversary of the Communications Directorate of the Navy, 1988 issue. $29.00 30th Anniversary of a Pacific Fleet Naval Unit, circa 1981. $30.00 40th Anniversary of the Technical Agency, Order of the Red Banner North Fleet, In excellent condition. $40.00 Badge in Commemoration of the 70th Anniversary of EPRON - PSS (Naval Search and Rescue Service), 1991 issue. One of the last naval badges of the Soviet era, apparently issued to one of the veteran scuba divers of the unit. Maker marked "LMD" (Leningrad Mint) on the reverse. In excellent condition.